KOKOMO, Ind. 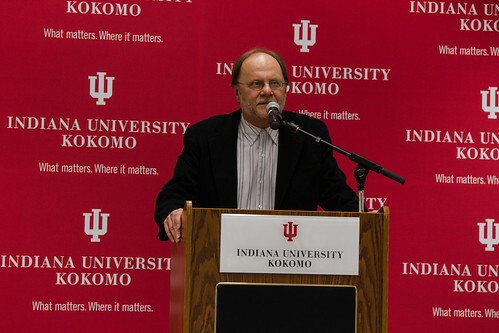 — Indiana University Kokomo bids farewell to faculty and staff members, including several who have experienced nearly half the campus' history. Rick Aniskiewicz speaks during the retirement celebration. See more pictures on Flickr. Rick Aniskiewicz, professor of sociology; Ann Cameron, associate professor of English, Dinah Downhour, coordinator of the nursing lab, and Cindy Ison, senior lecturer in music, were honored at a retirement reception recently, honoring their many years of service to the campus. Chancellor Susan Sciame-Giesecke noted that Aniskiewicz and Cameron both have been at IU Kokomo about 35 years, about half of the campus' 70 years, and Downhour and Ison also have had long careers here, teaching many students. "It isn't just about the total years of service, however, but the life they put into this institution while they were here," she said. "They played major roles in the development of IU Kokomo. We appreciate their service, and wish them well as they retire." Aniskiewicz came to IU Kokomo in 1980, and has served as a sociology professor, instructor in the freshman learning community, and mentor to countless students. He has received the Claude Rich Excellence in Teaching Award, and participated in IU's Faculty Colloquium on Excellence in Teaching (FACET). He was chairperson of the sociology, history, and political science department for 12 years, when it was called social and behavioral science. In more than 35 years at IU Kokomo, Ann Cameron has taught more than 30 different courses, including many she created herself. She has been honored with the Trustee's Teaching Award and the Claude Rich Excellence in Teaching Award, and was chairperson of the Department of Humanities. She has written more than 100 entries in reference works and spent more than a decade indexing works for the MLA International Bibliography. Dinah Downhour has managed and coordinated the nursing lab since 1984. She makes sure the lab has the equipment needed, maintains it, repairs it, and teaches students and faculty how to use it. She also became the School of Nursing's technology expert, and is its web manager.